The tree tap is the first polycraft inventory that can be crafted. The tree tap has functionality similar to a hopper. In fact in many situations, it can be used instead of a hopper as a less expensive alternative. The tree tap can be placed on the size of any wood block, but not planks or slabs. 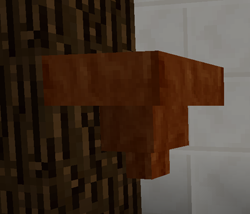 The wood block can be part of a living tree, but in the current polycraft release, this is not necessary. Thus a tall "tree" can be built and tapped. Tree taps that are on top of one another send their contents downward. In addition, by shift clicking on existing taps to add new taps, rubber farmers are able to also move good sideways. While it may seem appealing to construct, large, inexpensive pipe networks with tree taps, the functionality is nowhere near the pipes, pumps and flow regulators that can be crafted once a slightly higher technology level is reached. The tree taps spawn polyisoprene (or natural rubber) at a fixed rate. The bags of polyisoprene pellets spawn faster on jungle wood than other types of wood. After a tree tap, or series of chain tree taps have been generating rubber for some time, 64 bags may build up in the tree tap and automatically upcycle into a sack of polyisoprene pellets. 64 bags are equal to 1 sack. 64 sacks are equal to 1 powder keg.